Panama City, Panama – Aug 14, 2012 – After 17 days of sweltering heat in Cuba, we are rejoicing and relaxing in a wonderful little apartment with a gorgeous view in Panama. God did amazing things during our time there. The 2nd Radical Obedience School in Cuba lasted 10 days with 32 students including an Ecuadorian, 6 Bolivians, & 3 Chinese. Both Steve and Amelia taught multiple sessions in the school while Amelia also led a small discipleship group of young ladies that included a Bolivian, Chinese, and 3 Cubans. Amelia translated some of Steve’s sessions and of other teachers Bram from Holland and Abner from the USA. We could see much transformation occurring in both the hearts and minds of these emerging young leaders. 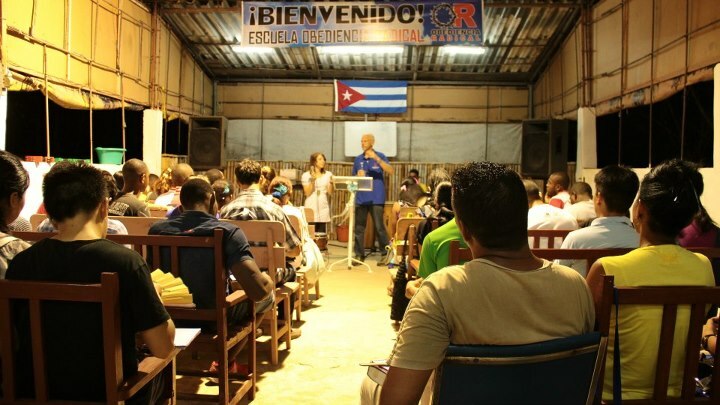 Steve was also able to share and minister a few times in different churches in Havana to bring encouragement and teaching through a prophetic word from God about Cuba from Isaiah 60. We are very thankful for your support to help us be a part of the change God is bringing to Cuba. It hasn’t been easy work, but it is definitely worth while and making a difference. We have made some even bigger plans for 2013 and beyond. Steve teaching and Amelia translating into Spanish for the 32 students from Cuba, Bolivian, Ecuador, and China. We are mostly resting and recovering at the moment with a little site seeing thanks to our wonderful host, the House family. But, we have some very exciting plans for our time of ministry here in Panama. 3 Brazilians from Fortaleza are also here with us. We will all go to an Indigenous village to minister one day and have a few different Indigenous & Latin churches to speak and minister in on other days. On Saturday, we will be doing a leadership seminar for Indigenous peoples at the University of Panama that will include Christians and non-Christians. The chief of one of the main tribes of Panama will be a participant. Please continue to pray for us during this very strategic time of opportunity for both now and future work here. We finish here on the 20th with Amelia going to Mexico City while the Brazilians and Steve return home to Brazil. Thanks & blessings to everyone. Watch for a more complete report later!